I had heard about The Great British Bake Off, but it wasn’t until recently that I finally had time to sit down and watch it. For the uninitiated, the Great British Bake Off (GBBO) is an elimination-style baking competition featuring amateur home bakers. Each episode features a type of baking and each contestant bakes 3 different recipes of that “type” and then at the end of the episode, one baker is eliminated. It’s a fun show, fairly good-natured and you root for all the contestants. You feel their pain when their cakes crack, their decorations wilt, or when their cream breaks. We’ve all been there. You hope for fair competition and some quality baked goods! I must bake all the recipes to the best of my abilities. I can interpret the recipe as I see fit. I must bake all the items IN ORDER. And with that…here we go. Signature Challenge – a bake using a tried and tested recipe that the amateur bakers make for their family and friends. Technical Challenge – a bake using the same ingredients and recipe provided by the judges Berry and Hollywood. The recipe however is intentionally sparse and has missing instructions, as it is designed to test the knowledge and skill of the bakers. The bakers are not told beforehand what the challenge might be. The judges also judge this blind as everyone has been given the same recipe, and the judges then rank the bakers from worst to best. Showstopper Challenge – a bake designed to impress the judges. What the bake looks like is also taken into consideration. 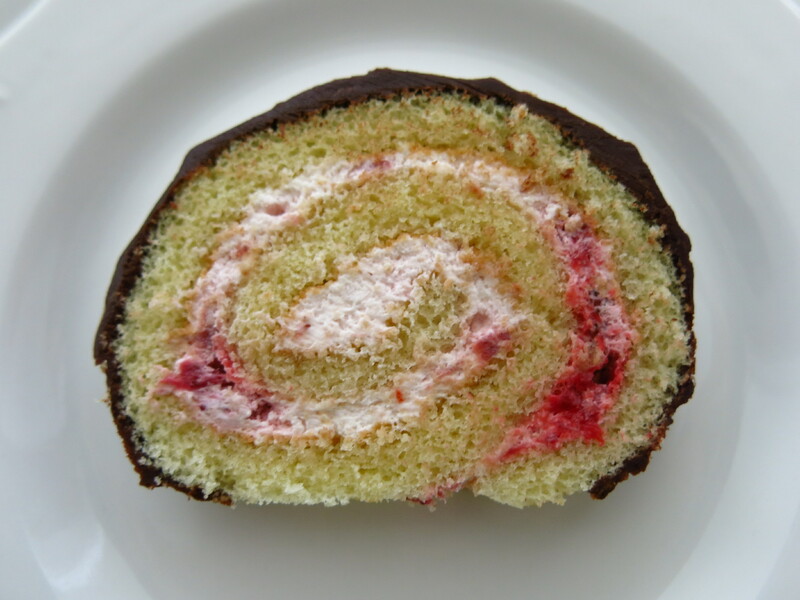 My first challenge is the Swiss Roll – also known as a Jelly Roll, Rolled Cake our Roulade. Forms of this include the VERY challenging “Buche de Noel” (ie. Yule Log). 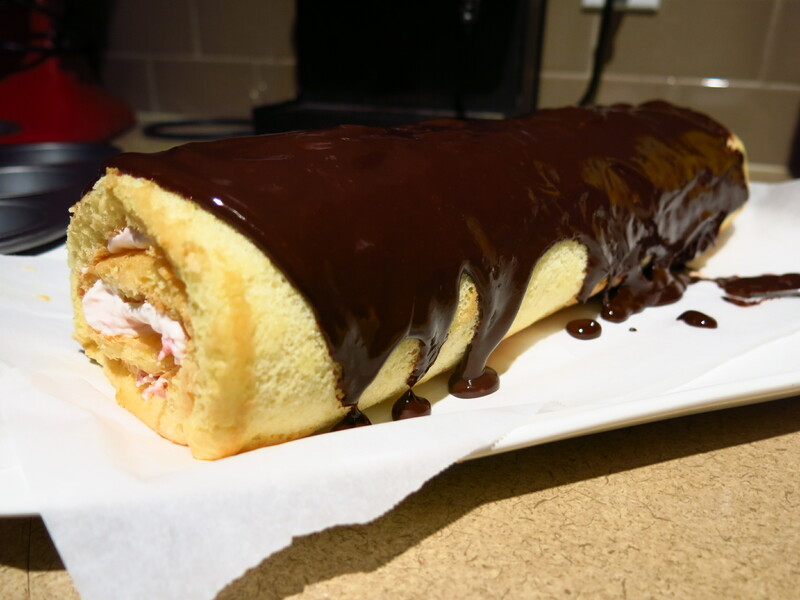 This was a true challenge for me as I have only made a Swiss Roll cake once – a failed attempt at a Yule Log, I believe, 10 years ago. My sponge was poor and the filling was way too runny. I was lucky that my guests thoroughly enjoyed my meringue mushrooms! 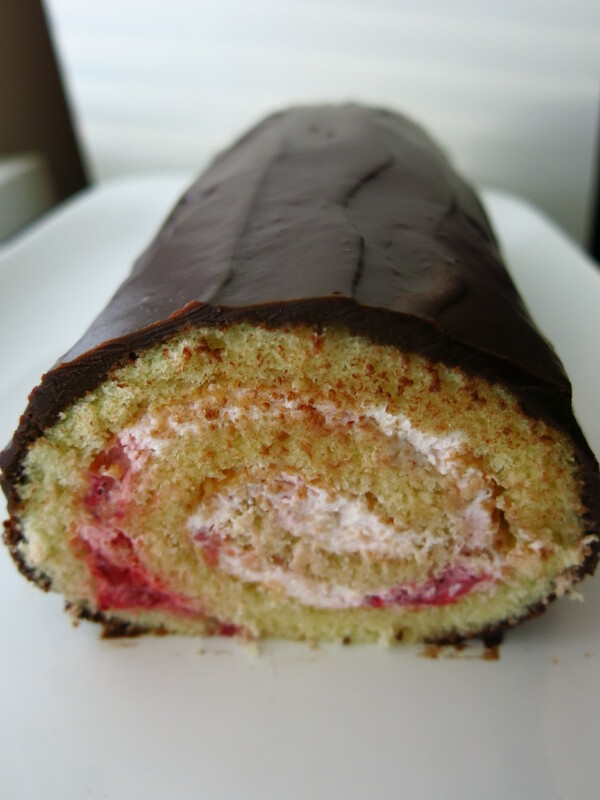 I did a lot of research on the cake base for a Swiss Roll or a rolled cake. There is no set standard – it’s just a pliable sponge, so an egg-heavy cake batter that’s whipped up and flour gently folded in. No butter. I decided to go old school and use a simple rolled cake recipe from Maida Heatter. For anyone who has followed a Heatter recipe, it’s definitely “old school”. The method is written in a narrative style, so no bullet lists! You have to read it carefully and exercise patience. However taking it slow definitely paid off and I was rewarded with a very even and tasty vanilla sponge. The best tip gleaned from the recipe was to pour the patter in ribbons up and down the pan, so really trying to avoid pushing it around after with an offset spatula (so laying down the batter as best as you can). As soon as the cake was out of the oven, I let it sit for about 5 minutes before rolling it. So when you’re rolling a cake, you want to be sure that the cake is covered on both sides, so I put a piece of parchment on the top of the cake as well. This is so that the cake doesn’t stick to itself when you unroll it. The point of rolling the cake is so that it keeps a nice rolled shape when you do fill it. 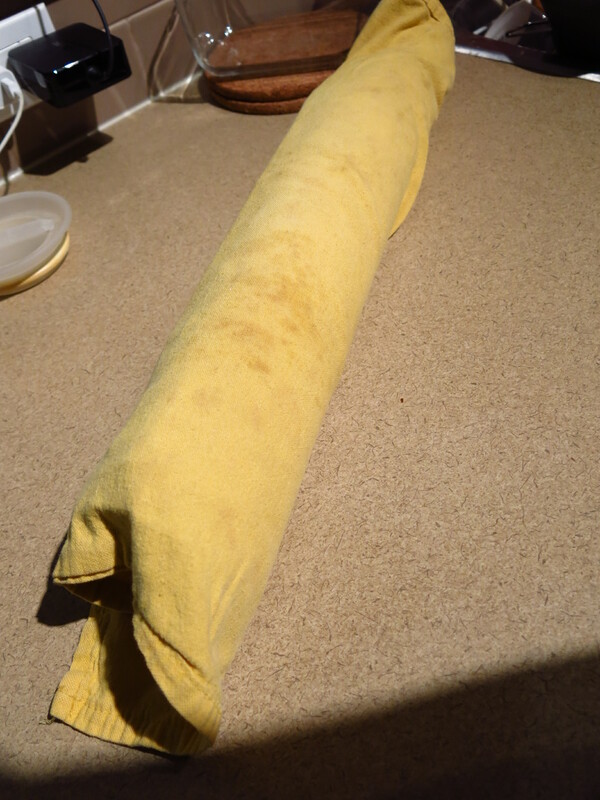 I did put the cake on a tea towel to roll it, this really is to help roll the cake and transport it. 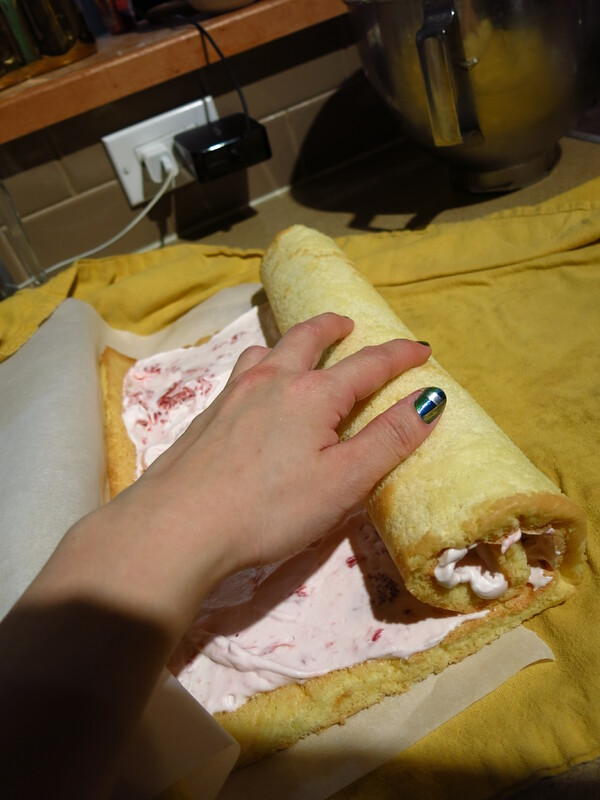 You wrap the rolled cake up nice and snug in the towel and let it cool before filling it. The cake rolled in a tea towel nice and snug. I had to work fast so no pictures of the in-progress action! I layered two pieces of parchment under the cake (on the final display plate) before I poured on the ganache. Once the ganache is sort-of set, you carefully remove the parchment…and voila! A clean plate. 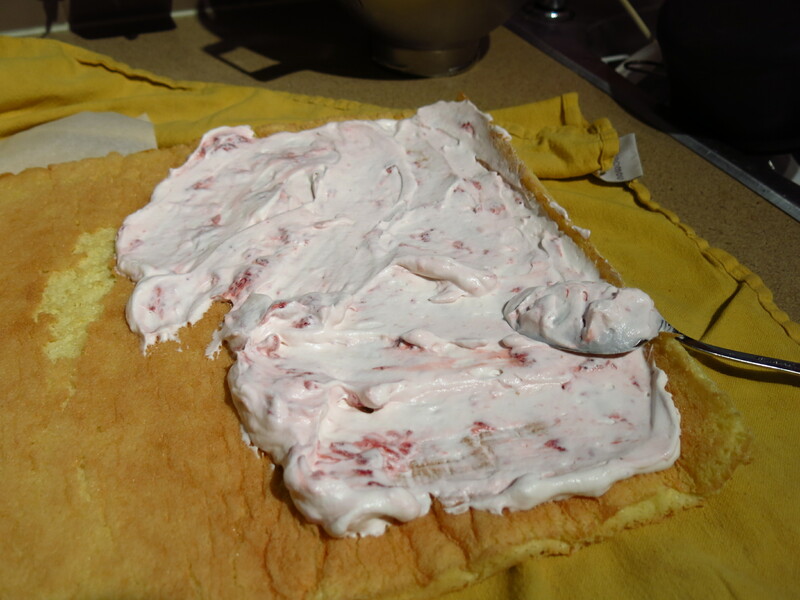 The filling was a basic whipped cream that had thawed & chopped strawberries folded in. It made for a delicately sweet and strawberry flavoured cream. Yum! The whole thing was then covered with dark chocolate ganache. I would say that years of making cake has helped my technical expertise in understanding how this cake is constructed. I know that sounds silly, but it’s taken a lot (a LOT) of failed cakes and experiments to understand the importance of structure, temperature and flavour balance. I think a lot of my success with this cake has to do with my comfort in manipulating cake. I will definitely make this cake again!